If you have been searching in vain for a belt sander that can be easily used on the vertical, then stop right now! The Triton TA1200BS comes with a vertical stand and clamps, things that many professional users have often complained are missing from most sanders that don't cost several hundred dollars. The TA1200BS also features a front roller, which gives it fantastic accessibility, and means you can sand to a fine finish in even the tightest spots. 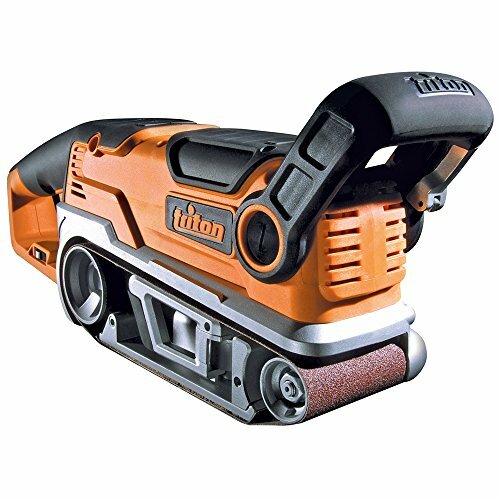 The Triton is a true all-purpose sander. Whether you simply want to have something in your tool box that could cover any eventuality, or are a professional carpenter with a high-volume workload, the Triton has the power and versatility to meet all of your needs. The core features of the Triton's design are power and flexibility, and it adds a little extra wow factor by including the ability to mount and use it on the vertical. The TA1200BS features a powerful 10-AMP motor, as well as variable speed control, which makes this machine one of the best belt sanders within the category. This is somewhat reflected in the price, but considering what this machine has to offer, it’s well worth the money. The Triton TA1200BS comes in cheaper than you might imagine, given its power and functionality. If you're not too worried about finding replacement parts, it's definitely a good investment. And for professional carpenters and handymen, it wouldn't be too much of a hardship to simply buy a replacement sander at the price the Triton falls, meaning the difficulty in sourcing parts becomes a non-issue.